Dike (/ˈdaɪkiː/ DY-kee; minor planet designation: 99 Dike) is a quite large and dark main-belt asteroid. Dike was discovered by Alphonse Borrelly on May 28, 1868. It was his first asteroid discovery. It is named after Dike, the Greek goddess of moral justice. Three-dimensional model of 99 Dike created based on light-curve. Based upon a light curve that was generated from photometric observations of this asteroid at Pulkovo Observatory, it has a rotation period of 18.127 ± 0.002 hours and varies in brightness by 0.22 ± 0.02 in magnitude. But according to Shrindan E. (2009) the rotation period is of 10.360 ± 0.001 h.
The asteroid is located near the Juno clump of asteroids, but is most likely unrelated. ^ a b c "99 Dike". JPL Small-Body Database. NASA/Jet Propulsion Laboratory. Retrieved 12 May 2016. ^ a b Pilcher, Frederick (October 2011), "Rotation Period Determinations for 11 Parthenope, 38 Leda, 111 Ate 194 Prokne, 217 Eudora, and 224 Oceana", The Minor Planet Bulletin, 38 (4), pp. 183–185, Bibcode:2011MPBu...38..183P. ^ DeMeo, Francesca E.; et al. (2011), "An extension of the Bus asteroid taxonomy into the near-infrared" (PDF), Icarus, 202 (1): 160–180, Bibcode:2009Icar..202..160D, doi:10.1016/j.icarus.2009.02.005, archived from the original (PDF) on 17 March 2014, retrieved 22 March 2013. See appendix A. 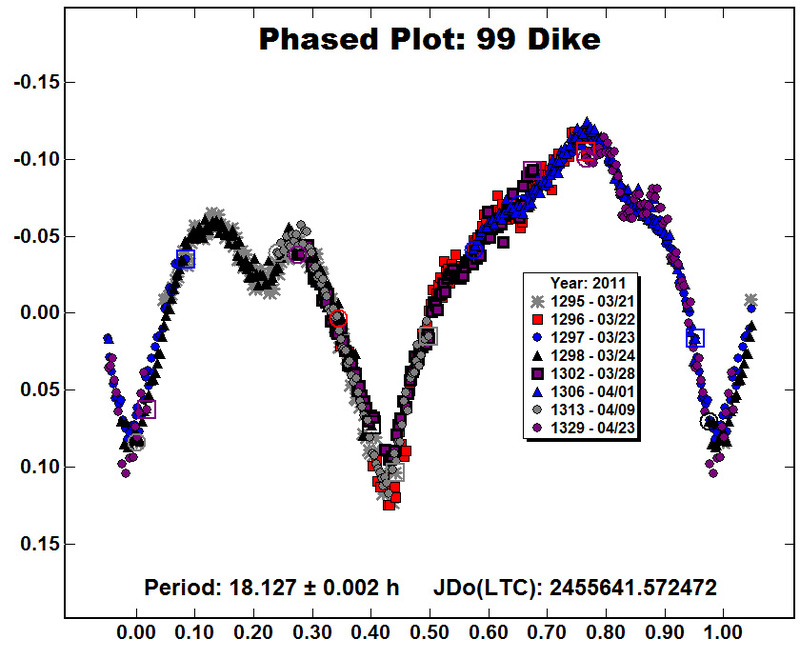 ^ Sheridan, Edwin (2009), "Lightcurve Results for 99 Dike, 313 Chaldaea, 872 Holda 1274 Delportia, and 7304 Namiki", Minor Planet Bulletin, 36, pp. 55–56, Bibcode:2009MPBu...36...55S.